For some weird reason, cats just want to keep us away from books, laptops, iPads, smartphones and newspapers in general. Science still can’t explain the reason why whenever we open a book or turn on our computer they suddenly feel an immediate need for attention. If you have a cat you certainly have experienced this phenomenon. It happens every single time we are going to do something that involves reading. Here are 21 hilarious pictures that prove this theory. What about you? Is your cat doing the same? 2. You no read, you play with me. 4. No time for Japanese. Time to give me food. 5. Could I use some help? 6. When your cat is the only news you are allowed to read. 8. You no turn the page. I no finished. 11. Are you looking at me now? 12. Humans end up acting like the cat was invisible. 15. So you thought you could study today? 18. As my friend said before, enough for today. 19. No way you will use your laptop. 20. This book looks soooo booooring! 21. 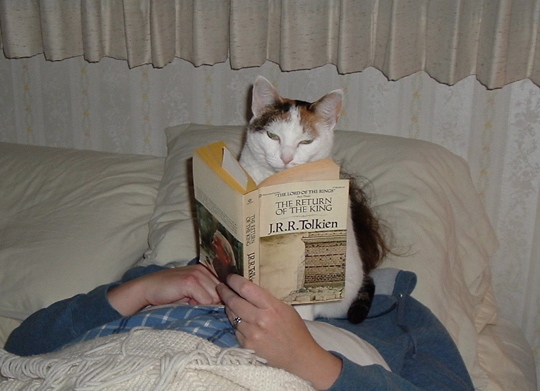 Bonus: 15th century cats hated books too! If you have a cat, you know this is all true. Share this post with your fellow cat lovers!